Eastern Ontario District PAOC District Superintendent Craig Burton presents Rev. Alvin Peddle and his wife Glenda a certificate for the church's 75th anniversary in this Sept. 18, 2011 photo. Pastor Alvin Peddle (centre), with church board members (from left) Jim Toms, Paul Donald, Elaine Moore and Leonard Coens. 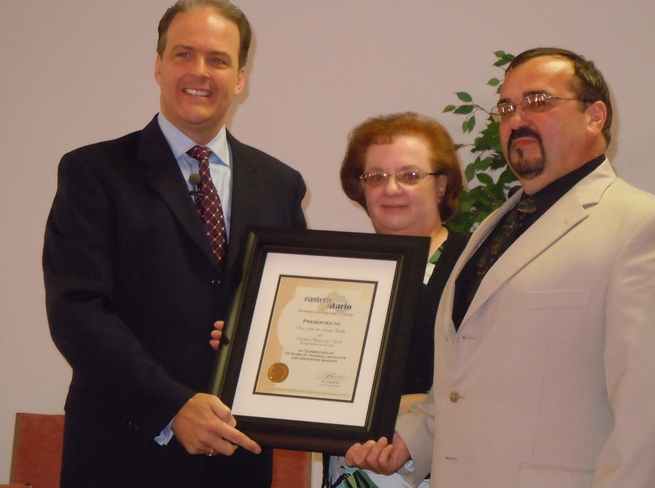 Pastors Alvin Peddle and his wife, Glenda, who are both credentialed with the Pentecostal Assemblies of Canada, moved to Marmora in May of 2009 to give leadership to Marmora Pentecostal Church. Alvin serves as Lead Pastor and Glenda as Assistant Pastor. Together they have pastored since 1982, first in their home province of Newfoundland and, since 2003, in Ontario. They have two adult children living in Kitchener, Ont. : Valerie and Vance. Valerie is married to Andrew and they have two children, Wyatt and Kaiya. Believing that a personal faith in and a relationship with Jesus Christ is the greatest experience anyone can have, Alvin and Glenda have a desire to provide through church ministry opportunities for the church family to grow in their personal relationship with Christ. At the same time, they have a passion to connect with the community of Marmora and area in such a way that many other lives would be impacted with the truth of God’s love and grace.